360 views from multiple roof top living areas. Sleeps 8 with 4 full baths. 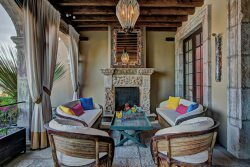 Casa Terrazas in the heart of San Miguel de Allende offers all the comforts of a modern home with charm of the finest homes in this historic town. From the minute you walk into the home you know it is special. 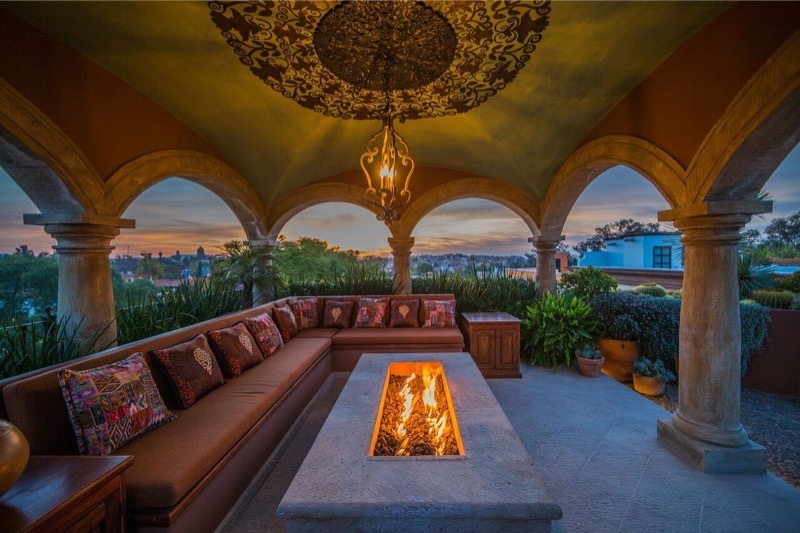 The three story, three bedrooms with en-suite bathrooms offer luxury accommodations from the boveda ceilings to finely appointed furnishings from all over the world custom made for Casa Terrazas. A fourth room is offered with twin beds, this room located in the basement next to the gym, theater room and wine room, has access to the 4th bathroom steps away. There are two half baths, one on both main floors for guests convenience. Artwork commissioned both locally and globally gives you the appreciation of this artistic community. This home provides warmth and beauty with fire places in the three en-suite bedrooms and living room. Enjoy countless hours on the four roof top terraces enjoying the ideal weather San Miguel has to offer. Eat a fine meal in either the interior dining room or ride the elevator to the roof dinning room for the most incredible dining experience. After dinner enjoy the night around the fire pit on the roof terrace and all the lights San Miguel offers. Stroll through the roof top gardens in the evening with the ambient lighting and enjoy the lavender and many other fragrant flowers from the gardens. Casa Terrazas comes equipped with a full gym and theater room for in house entertainment along with two other TV's with both Spanish and English channels all the American major channels provided. The entire house has strong WIFI and the TV's all have streaming video options along with cable. The house has two phones one for free international calls and the other for local calls. The entire house has a filtered water system safe to drink. The staff includes an offsite house manager who will be in contact with you before and during your stay to make sure you have everything you need to have a wonderful stay. Two gardeners who keep the multiple gardens looking so incredible along with a housekeeper who will prepare breakfast and an afternoon snack on request. All ingredients for the meals can be purchased by the house manager prior to arrival or on request at the time of visit. (All food cost are the responsibility of the guests) Prepare your own meals with the fully equipped gourmet kitchen from the local organic market just minutes walks from the house or have the house manger arrange for a small fee a cook to come in for additional meals based off the menus provided.